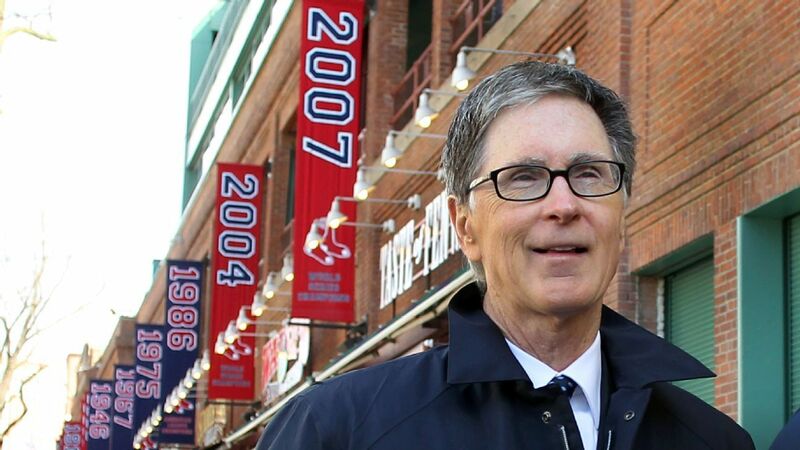 FORT MYERS, Fla. – An apparent contradiction to his own commissioner, Boston Red Sox owner John Henry said Monday that, while there is no perfect correlation between a bigger payroll and winning, "spending more money helps." His Red Sox had the highest Payroll in the sport in 2018 and their fourth World Series title since Henry became the principal owner of the franchise in 2002. During a media session on Sunday in West Palm Beach, commissioner Rob Manfred, addressing the cold free agent winter that has Bryce Harper and Manny Machado still unsigned, said, "I reject the notion that payroll is a good measure for how much a team is trying or how successful that team is going to be." Aiming to speed up the pace of play in baseball , Major League Baseball Commissioner Rob Manfred says the league will start implementing pitch clocks in spring training games. Asked about that comment and whether there is a correlation between spending and winning, Henry replied, "I think the Balt The payroll was double the payroll was last year. Close to double. There is a correlation, I'm sure there is a correlation, but it's not as perfect. It's very difficult to predict things in baseball, to predict player performance. Spending more money helps. "Many believe the luxury tax is working as a de facto salary cap, driving down spending, especially in free agency. Henry didn't completely agree with that assertion, however.
" It has an influence, but the biggest influence is trying to lose money, "he said." I was talking to an owner of a big team at the owners' meeting and he had the same viewpoint. It's not the luxury tax he worries about. … Even though people are frustrated and the players are frustrated with free agency, we find ways to spend money on other areas in baseball. " The Red Sox and Nationals were the only teams to exceed the $ 197 million luxury Tax threshold in 2018, with the Red Sox paying a $ 11.95 million penalty The combined penalty between the Red Sox and Nationals was less than $ 15 million, the first time the combined tax was low since 2003. The tax threshold increases to $ 206 million for 2019 and then $ 208 million and $ 210 million next two seasons. Baseball reported revenue of $ 9.4 billion in 2018, up from $ 9.1 billion in 2017, but overall spending on team payroll declined $ 18 million, the first decrease since 2010 and only the second drop since 2004. During an interview last Friday at 590 The Fan in St. Louis, Cardinals pitcher Adam Wainwright said, "I think unless something changes, there's gonna be a 100 percent strike. I don't think anybody's hiding that. I just worry people are going to walk out midseason. " The current collective bargaining agreement between the owners and players expires after the 2021 season. Henry was on the negotiating committee that struck that deal and suggested if the union is unhappy, it needs to come to the table with ideas. Asked about Wainwright's comment, Henry said, "That's crazy. A lot has been said about the free-agent market, but it is a free-agent market. It is a free market, and the market is always what you want it to do. "It is important for the union to engage firsthand on what they would like to change. to the child of market we have today. " Henry and team chairman Tom Werner also addressed the team's potential signing of Chris Sale and Xander Bogaerts to long-term extensions. Henry addressed Sale, saying, "He's a special player. We'd love to be able to sign him, and he would like To, as well, there are the realities of the marketplace, budgets. This is his opportunity to be a free agent. We would like to avoid it, and I think he would, as well, so something could happen. 19659002] Asked if the slow free agent market could potentially help the Red Sox sign both players, since they might be unsure about what might happen in a free agency, Werner was more elusive. "Obviously, we're at a point in time – I think people are referring to the fact that Bryce Harper and Manny Machado haven't signed – but this point last year, we hadn't signed JD Martinez, so in some ways I think we can answer that question better in a month. " The Red Sox ended up giving Martinez a five-year, $ 110 million contract that includes opt-out clause s after both the 2019 and 2020 seasons. He responded with a monster season, hitting .330 with 43 home runs and a league-leading 130 RBIs and finishing fourth in the MVP vote.